Understanding our visitors, why they visit and what they do helps us to develop and promote one of Britain’s truly world-class destinations. Understanding our tourism businesses, what they are offering and how business is going in this highly competitive environment helps us provide the appropriate support. Research is key in achieving a continuously improving tourism destination that enhances the visitor experience and keeps people coming back again and again. An evidence-based approach is used to inform tourism management, development and marketing to help maximise resources. The research department delivers core activity to provide tourism organisations, businesses, and other partners with vital market intelligence and up-to-date analysis of business performance and economic impact. 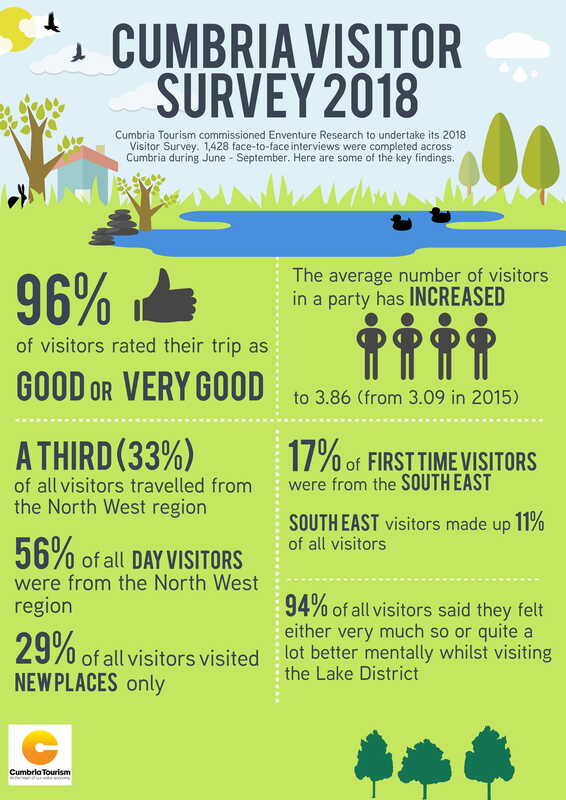 Cumbria Tourism commissioned Enventure Research to undertake its 2018 Visitor Survey. 1428 interviews were completed across Cumbria during June-September. The infographic below show some key findings and the full report can be purchased at HERE. Cumbria Tourism’s latest tourism business survey is currently available to complete. We want to hear your views on the key issues affecting your businesses right now: the challenges of Brexit, visitor giving, national minimum wage rates and overall confidence in our industry. Click HERE for a brief summary and HERE to access the full report for our Autumn 2018 survey. Thank you for your contribution, together we can make our voices heard. Monthly occupancy surveys with all types of accommodation providers, over 300 participants. Countywide visitor surveys, 2015 survey the most recent. Data collection from Tourist Information Centres and visitor attractions. Annual tourism economic impact assessment. Regular analysis of accommodation stock composition. Tourism Business Performance Surveys every six months. You can purchase invaluable research to help you benchmark your business against others, and provide you with key stats to help you plan future investment and marketing activity. If you are a Cumbria Tourism member you would also receive a 20% discount off the fee. Each year Cumbria Tourism runs a visitor volume survey amongst visitor attractions across the county. There have been increases over the last few years. Year on year, visits to visitor attractions in our sample increased by 3.3% in 2015, 7.2% in 2016, and 3.4% in 2017. For 2018, data was captured from 65 visitor attractions, 59 of whom had provided figures in both 2017 & 2018. These attractions, with 6.1m visitors between them, saw an increase of 3.5% in 2018 – an extra 206,000 visitors through their doors. Many people dream of escaping the rat race and starting a tourism business in a beautiful location like the Lake District, Cumbria. Prevent your dream from becoming a nightmare by making sure you know exactly what’s involved before you sign that resignation letter. Cumbria Tourism can offer you lots of support and information to help you plan for your new venture. One of the things we offer here at Cumbria Tourism is a Business Start Up Pack. These packs are designed specifically to assist potential new tourism businesses with business planning, decision making and providing evidence to help secure finance. The packs are prepared with research relevant to the planned business type and location.